Read on for more details of new finds recovered from Trench 2 during the last week of work. 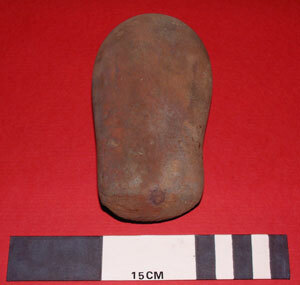 Grinding tools manufactured from sandstone pebbles continue to be the most common type of find recovered from Trench 2, with two more artefacts of this type found this week (see images below). It is possible that these tools may have been used in grinding grain of some form, or for crushing ore in the metalworking processes, which we know are taking place somewhere within the High Pastures site. Evidence for the processing of cereals is indicated by the fragments of rotary querns already recovered from the site, while a large fragment of a sandstone saddle quern was also found during excavations in Trench 2 this week. 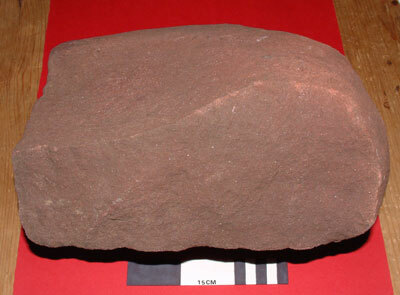 When uncovered in the trench the large piece of sandstone displayed a highly polished surface, this having quite a flat profile. 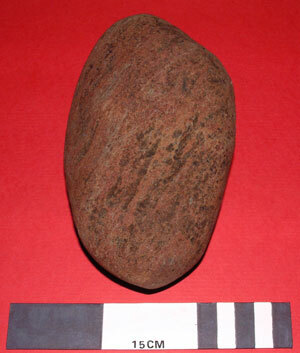 However, when we recovered the artefact a concave dished area was revealed on the opposite side of the stone, where cereal grains would have been ground into flour. Therefore, it seems that this artefact had two quite different functions. The image below shows four refitting fragments of pottery that were recovered from Trench 2 during the week ending the 25th April. 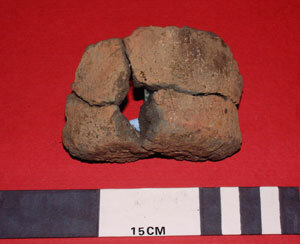 The sherds of pot comprise part of the base of a small undecorated vessel, with a slightly rounded bottom.